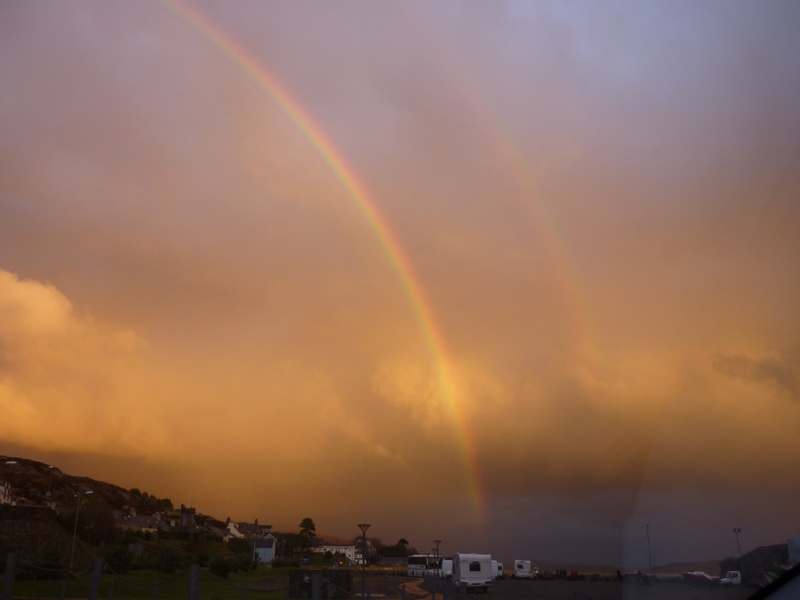 After a dramatic weather day the amazing light at about 5.30pm produced this spectacular rainbow while we were waiting for the ferry across to Skye. what a fairy tale ending to your stay! Such beautiful and unusual colours. Beautiful double rainbow! I have been fortunate enough to see several in recent weeks - my best year ever for these wonderful ephemeral delights! It really was breathtaking! We have lots of photos on our mobile phones....it seemed to change every 5 seconds and was just magnificent! Will add some interesting 'wet scenes' photos next week! That's an amazing sight. So you didn't come back on the first Sunday ferry?! @jmj hee hee...........Well just goes to show what we would have missed!!! Actually we got the 8pm ferry on Sat and had B&B on the other side before coming home today.................didn't know about 'the' ferry till we saw the news at home! @mittens thanks...........at the end of a very wet day it was a real gem! Sounds a fab holiday & you are seeing some gorgeous sights !!! Great capture ! OMG, the colors in the sky are awesome. Excellent capture! Lucky you! What a gorgeous sky and excellent capture. That is a fantastic shot - very dramatic and what strange colours! Two pots of gold somewhere in Hebrides then?